Price is definitely going to be a big factor when it comes to choosing a watch. When I first started working, I automatically ruled out any watch that cost more than $500. Once you've settled on a price range that makes sense for you, it is time to choose the best style, brand and quality that you can get. Also pay special attention to the shop you're buying from. If you're buying from the brand's official shop or a large retailer, you can be assured of the watch's authenticity and quality. Always be wary of dodgy looking shops offering expensive watches at a slight discount. You can never be sure if you're getting the real deal or not. There are many different price ranges when it comes to watches but as a start, we thought we'd cover some great timepieces for under $500. 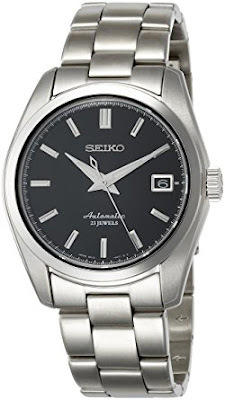 The Seiko SARB017 is a quality watch in the sub $500 price category. It's green dial with gold markings look absolutely stunning under the sunlight. It has a stylish look with all it's parts fitting an overall theme nicely. Although there is a bracelet option, we think it looks better with the brown leather strap. 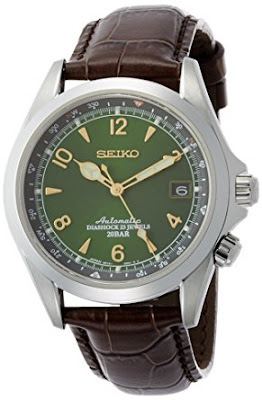 With 50 hours power reserve, 200 meters water resistant, a great build and terrific accuracy - all for less than $500, what's there not to love about the Seiko SARB017 Alpinist? Powered by the Seiko 6R15 caliber self-winding movement, the Seiko SARB 033 is an exquisite men's watch suitable for any formal occasion. The 6R15 caliber powers pretty much all of the Prospex series of watches by Seiko. The watch is water resistant to 100 meters and has a 50 hour power reserve. The SARB 033 has a black sports dial with luminous hands and hour markers in silver. It's stainless steel bracelets features a dual push-button release. Another interesting feature is it's exhibition back so that you can view your watch's movement in action. Overall, the SARB 033 boasts the finishing of a luxury watch but at a fraction of what you would pay for one. Well-built, accurate and absolutely stunning! You may not be familiar with the Hamilton brand but it is an American brand steeped in history. They used to be based in the US but are now under the Swatch watch group. The Khaki King has a simple and functional military style to it. A particularly useful feature that the watch has is the 24 hour marking above the 12 hour one. 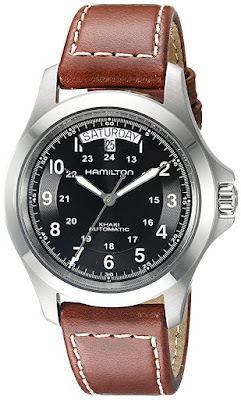 One big difference between the Hamilton Khaki King and other watches is that it's day of the week is full spelled out and that along with it's Date Window is located at the 12 o'clock position instead of the traditional 3 o'clock position. The khaki leather band makes for a great everyday, outdoorsy kind of a watch and if you need a more formal look, simply switch to a bracelet instead. 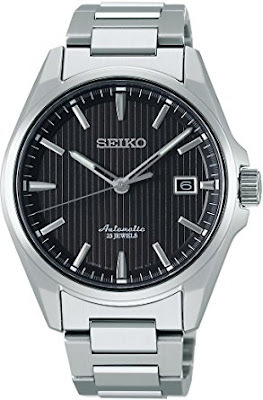 The Seiko Presage SARX015 is meant for the domestic Japanese market so it'll need to be imported over if you want to have it.The dial of the watch has a teak effect that many compare to that of Omega. It also features the Seiko 23-jewel 6R15C movement, which is auto-winding but can also be hand-wound and has stop-movement hacking. Overall, the Seiko Presage SARX015 is a solidly built watch that will suit the office or any formal occasion. I hope you've found this guide to buying a quality men's watch for under $500 useful. You may have noticed that Seiko features prominently in the list with three out of the four recommendations being a Seiko. Seiko is known for it's high quality at a reasonable price. It should therefore come as no surprise that even Hong Kong's richest man, Li Ka Shing, wears a $500 Seiko.